A selection of Financial Times interviews with high-profile figures in business, politics, the arts, science and more. 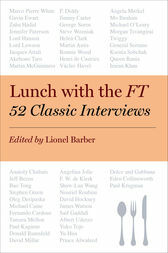 From film stars to politicians, tycoons to writers, dissidents to lifestyle gurus, Lunch with the FT gathers fifty-two fascinating interviews conducted at the unforgiving proximity of a restaurant table. The list of people who have participated in this popular feature since 1994 reads like an international Who’s Who of our times. Meet the rich and famous, the weird and the brilliant, the brave and the virtuous, all brought to you by the Financial Times’ global network of columnists and correspondents. This book brings you right to the table to decide what you think of Angela Merkel or Martin Amis, George Soros or Sean “P. Diddy” Combs, Angelina Jolie or Jimmy Carter. Meet not just oligarchs and royals, but the co-founder of Apple, the codiscoverer of DNA, the tycoon who will pay African presidents to quit, and one of the Arab world’s most notorious sons. Every interview is illustrated with a drawing of its subject, making this collection as visually impressive as it is enlightening and fun to read. Lionel Barber, editor of the Financial Times, has steered the newspaper to three Newspaper of the Year awards. He has co-written several books, lectured widely, and appears regularly on international TV and radio. He was previously a long-time FT foreign correspondent in Washington, Brussels, and New York. He lives in London.